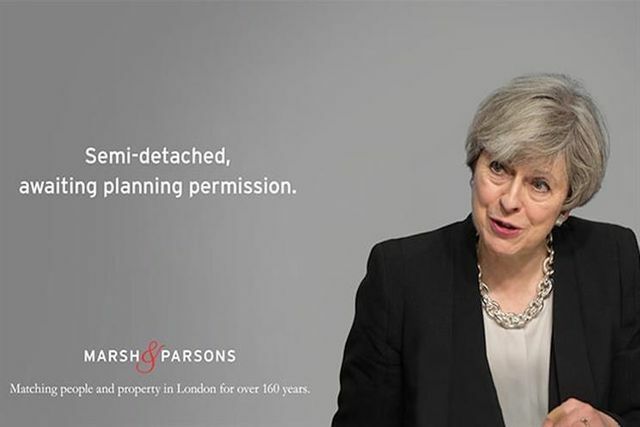 It has been reported this morning on Campaign Live that the Committee of Advertising Practice has advised a media owner to withdraw a poster ad for estate agency Marsh & Parsons featuring a picture of Theresa May with the headline "Semi-detached; awaiting planning permission". There are no reports of any complaints about the ad or of an ASA investigation, so presumably this comes from the Copy Advice team - but we simply don't know and the Campaign Live report is our only source. This is very troubling. Back in 1996 the ASA banned the infamous 'Demon Eyes' ad by The Conservative Party, now led by Mrs May of course, which featured a less than flattering image of Tony Blair. At the time, the CAP Code said that political advertising was outside the CAP Code but that the rules about "offensiveness" still applied. In 1999, when a new edition of the CAP Code was released and after the furore that followed from the Demon Eyes decision, CAP and the ASA washed their hands of all responsibility for regulating advertising by political parties in connection with elections and, you guessed it, referendums. As a result, we had the false claim about £350 million per week going to the NHS being paraded throughout the EU referendum on the side of a bus, even after Sir David Norgrove, Head of the UK Statistics Authority, had described it as a "clear misuse of official statistics". However, this means that ads by commercial or charitable organisations lobbying or raising awareness about a ‘political’ issue, or simply trying to make a joke about a contemporary political issue, are still caught by the CAP Code. The result is an inconsistent and unacceptable restriction on political free speech. In this case, assuming there has been no complaint about the ad, CAP has exercised 'prior restraint', a.k.a. censorship, by requiring the ad to be withdrawn. In the USA, where there are much stricter rules about the protection of image rights, it is likely that the Marsh & Parsons ad would be protected by the First Amendment. In other words, the First Amendment trumps politicians' image rights. The message to CAP is this: either regulate political advertising, or don't. It is simply bizarre to resile from responsibility for regulating political advertising during elections and referendums over issues of substantiation and misleadingness concerning claims that really matter and then to censor an ad with a very mild gag which is an expression of political free speech. There must also be a question mark over Marsh & Parsons’ abilities as an estate agency. They wrongly describe Mrs May as semi-detached, when in fact she’s clearly a bungalow. There’s nothing upstairs. CAP advice: ads "must not unfairly portray or refer to anyone in an adverse way unless that person has given the marketer permission to allow it".